The charm of Nantucket is apparent as soon as you step off the ferry. The town features boutique shops, art galleries, quaint inns, cobblestone streets, and stately homes. Some of the shops and galleries are housed in wharf shacks along the harbor. Nantucket is home to some of the finest restaurants on the East Coast, There are more than 800 historic homes and buildings in the town. 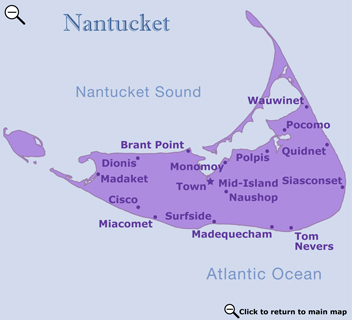 Most of Nantucket's historic sites are located in the center of town within easy walking distance of one another. Children's Beach – It is an easy walk from town to this small beach. Because it is in a protected cove on the harbor, it is a wave-free beach and thus ideal for small children. A lifeguard is on duty, restroom facilities are available, and there is a snack bar. It also has a play area for children, picnic tables, and a bandstand where concerts are held in the summer. Jetties Beach — Just a half mile walk or bike ride from town to the west, this beach has tennis courts, a skateboard park, and a playground. With its gentle surf, it is a nice beach for families. It has changing rooms and showers, a playground, public tennis courts, and volleyball nets. Windsurfing, sailboat, and kayak lessons and rentals are available. The annual Boston Pops concert is held on Jetties Beach. This beach is just a five-minute walk from Main Street. Its calm harbor waters make it ideal for swimming and kayaking (rentals are available). There is no lifeguard. Swain's Wharf – This off-the-beaten-path downtown waterfront area offers art galleries and artists studios, and eclectic shopping. The Nantucket Whaling Museum provides a fascinating look at the history of whaling industry. The museum's centerpiece is a 46-foot skeleton of a sperm whale suspended from the ceiling. Be sure to sit in on one of the daily lectures. Although it's a great activity for a rainy day, you'll find that everyone else will be doing the same thing. William Alexander, a Nantucket native, provides the popular Nantucket Ghost Tour. Tours meet at the steps of the Pacific National Bank at the top of Main Street. Just Look for the man in the top hat! To learn more call (508) 292-0164, send an email , or visit the website TheNantucketHauntedHike.com. For a spectacular 360-degree view of Nantucket and the ocean beyond, climb the 92 steps to the top of the steeple. At the mezzanine level, there is a collection of historic photographs and artifacts on display. The church and its steeple are open to the public seasonally from mid June through mid October. The First Congregational Church is also home to an annual Blueberry Festival held in early August. Nantucket Atheneum – This historic Greek Revival building built in 1847 is one of the oldest libraries in continuous service in the country. On view are historical books, paintings, sculptures, ship models, and scrimshaw. The adjacent Atheneum Park provides a nice place to relax. Aquarium – Housed in a small, charming cottage, the Nantucket Aquarium offers information about the aquatic life found in Nantucket's salt water marshes as well as the many varieties of crustaceans and fish found around the island. Children's activities include hands-on workshops and outdoor excursions. The Old Mill, which was constructed of salvaged wood in 1746, is located on Prospect Street and is the oldest functioning mill in the country. During the summer months, you can witness the original hand-crafted wooden gears use the wind to grind corn into meal. Nantucket's Oldest House, the Jethro Coffin House : Built in 1686 as a wedding gift for Jethro Coffin and Mary Gardner, this is the only remaining structure from Nantucket's 17th century English settlement. It was struck by lightning in 1987 and was almost totally destroyed. It was meticulously restored and now provides a glimpse into the lives of the island's earliest settlers.